Editor-in-Chief Dr. Yinsog Rhee, St. Cloud State University, USA. 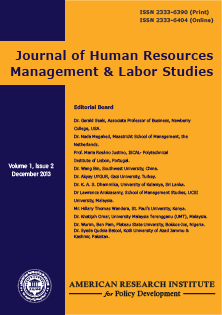 Journal of Human Resources Management and Labor Studies is an international scholarly journal that publishes original materials concerned with contemporary human resource management. The journal provides practicing managers and academics with the latest concepts, tools, and information for effective problem solving and decision making in the fields of HRM and Labor Studies. It explores issues of societal, organizational, and individual relevance. The journal publishes articles focused on new theories, new techniques, case studies, models, and research trends of particular significance to practicing managers. The target readers and beneficiaries of the journal include academic and business researchers, theorists, consultants, and executives. Journal of HRM and Labor Studies strives to create a bridge between theory (academic research) and real-world practices, allowing academicians to learn from practitioners and allowing practitioners to apply leading-edge research theories to their day-to-day operations. Each paper published in Journal of Human Resources Management and Labor Studies is assigned a DOI®number, which appears beneath the author's affiliation in the published paper. Click HERE to know what is DOI (Digital Object Identifier)? Click HERE to retrieve Digital Object Identifiers (DOIs) for journal articles, books, and chapters. Dr. Gerald Seals, Associate Professor of Business, Newberry College, USA. Mr. Michael Chambers, Department of Business and Technology Management, Northcentral University, USA. Prof. Maria Rosário Justino, ISCAL- Polytechnical Institute of Lisbon, Portugal. Dr. Wang Bin, Southwest University, China. Dr. Akyay UYGUR, Gazi University, Turkey. Dr. K. A. S. Dhammika, University of Kelaniya, Sri Lanka. Dr Lawrence Arokiasamy, School of Management Studies, UCSI University, Malaysia. Mr. Hillary Thomas Wandera, St. Paul’s University, Kenya. Dr. Khatijah Omar, University Malaysia Terengganu (UMT), Malaysia. Dr. Wurim, Ben Pam. Plateau State University, Bokkos-Jos, Nigeria. Dr. Syeda Qudsia Batool, Kotli University of Azad Jammu& Kashmir, Pakistan. Dr. Marcos Komodromos, Department of Communications, School of Humanities, Social Sciences & Law , University of Nicosia, Cyprus.